SALVAGE AND DEMOLITION: A book collector discovers a manuscript that results in a time traveling adventure to save the world. THE BIBLE REPAIRMAN: A psychic handyman, who is currently semi-retired and paid to eliminate troublesome passages of the Bible, is asked to return to the work he used to do and save the kidnapped ghost of another man's daughter. APPOINTMENT ON SUNSET: A group of men are trying to save another man's life by making him repeat the sequence of events that led to his death in 1964, but trying to change the end results. Saving him is a side effect of what they really want to do. THE BETTER BOY with James P. Blaylock: "A scaled-down horticultural version of Hemingway’s The Old Man and the Sea, with a tomato instead of a marlin." PAT MOORE: A chain-mail letter promising good luck after you send it on to ten friends is more sinister than it seems. 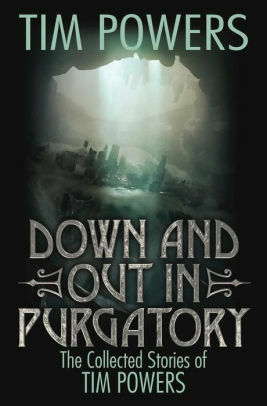 THE WAY DOWN THE HILL: A we’d-all-be-better-off-dead story about a family of immortals who jump from one host to another. ITINERARY: a time traveling ghost story. A JOURNEY OF ONLY TWO PACES: A man settles an old friend's estate which requires a trip to a strange apartment building. THE HOUR OF BABEL: A group of men need help time-traveling to June 21,1975, the night when "God vomited on Firehouse Pizza." WHERE THEY ARE HID: Inspired by the Fritz Leiber novella, "You’re All Alone." A chrono-jumper has undisclosed plans. WE TRAVERSE AFAR with James P. Blaylock: A grieving man has an encounter during the Christmas season. THROUGH AND THROUGH: A ghost comes to a confessional and wants absolution from the priest. NIGHT MOVES: An imaginary playmate tracks down a boy, no matter where he moves. DISPENSATION: two men encounter kittens and a ghost. A SOUL IN A BOTTLE: A man meets a ghost - and falls in love with her. PARALLEL LINES: The surviving elderly sister grieves the loss of her twin, who is trying to communicate with her. FIFTY CENTS with James P. Blaylock: A man is searching used book stores for a particular book when he encounters some supernatural trouble. NOBODY’S HOME: A prequel for the character of Jacky Snapp from the novel The Anubis Gates. A TIME TO CAST AWAY STONES: A story about Edward Trelawny, a real historical figure; "a liar who eventually came to believe his own melodramatic fabulations." 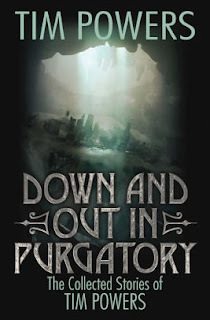 DOWN AND OUT IN PURGATORY: A man vows to kill the man who murdered the woman he worshiped from afar. SUFFICIENT UNTO THE DAY: A family's Thanksgiving feast takes a dark turn as the invited ghosts of relatives past accidentally draw soul-stealing demons into the family television set.